Children’s health continues to be at the center of much discussion amongst many stakeholders, including parents, teachers, government bodies and health practitioners. An overwhelming 33% and 25% of girls and boys, respectively, are said to be obese and to cost the country an astounding 2 billion annually. One argument is that young children aren’t drinking enough water, turning to unhealthy alternatives such as sugary drinks that they consume on a regular basis. On the school front, stakeholders must ensure that more sources of water are available on the premises, especially where children frequent, i.e. the playground. This is where outdoor drinking fountains are the most ideal source of water. Why do I need an outdoor drinking fountain for my school? Just like adults, if not more so, children need to consume at least eight cups of water. The rationale behind this is that they tend to have a very demanding day. 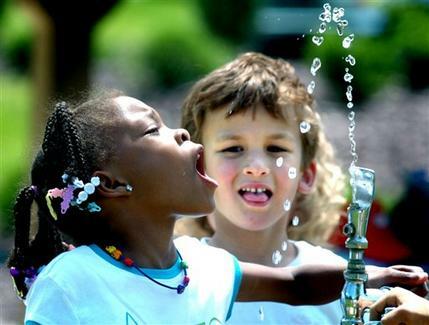 Without access to convenient sources of water, such as an outdoor drinking fountain, children will turn to sugary drinks that may contribute or lead to obesity. What’s more, children also spend up to eight hours at school on the playground or in class. Both of these are demanding, burning energy and leading to dehydration. Outdoor drinking fountains provide chilled water on demand that rehydrates kids playing on the grounds, leaving their thirst quenched. By drinking from such a fixture, they will see no need to have to turn to sugary drinks. Placing a drinking fountain outdoors won’t automatically attract children to drink water, but it’s a start and the best and most effective option available. When you have finally installed the desired amount of dispensers around your playgrounds, you must also try to set up initiatives that encourage them to drink more. Teachers must timeously remind children during class to drink water, providing the benefits of doing so in the process. Incentives can be set up that reward children who partake in the initiatives. This will have a rolling effect, as more kids see that not only is drinking the water good for their health, but also rewarding in other ways. Such initiatives shouldn’t be once off; they should be continuous efforts that also involve parents as much as they do teachers and principals. You can also look at acquiring your own branded school bottles that will promote school pride. These will work well with outdoor fountains or filling stations, as kids only need to fill up their bottles and enjoy water wherever they go.